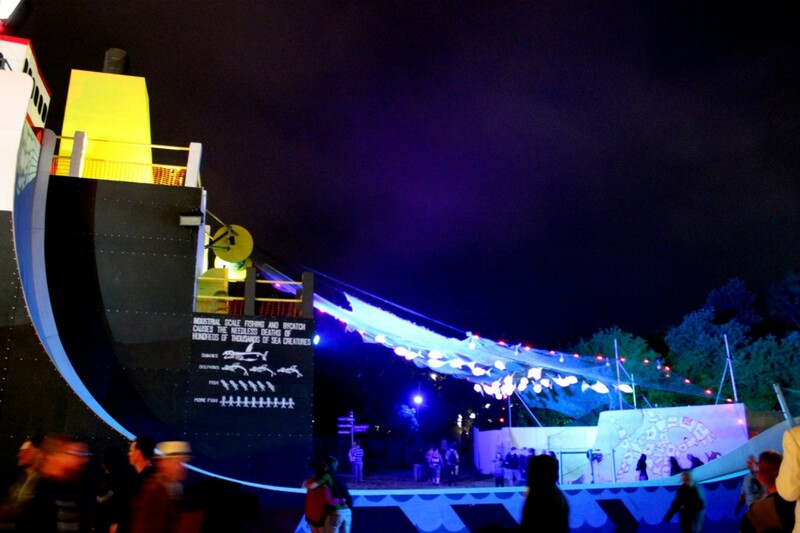 For the Greenpeace Field in 2015, the field was themed to focus on the fate of the Oceans, as there is a crisis happening at sea. Fish populations are plummeting due largely to industrial scale fishing practices, the oceans are awash with plastic rubbish, and coral reefs are dying and being destroyed. 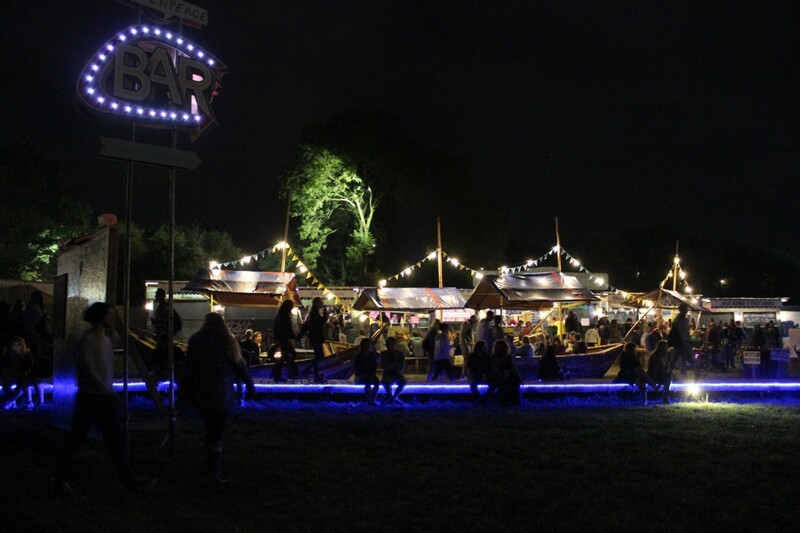 As Creative Director I had to create a field which, like a film set , would communicated the key themes to the public in a clearly understandable and engaging way. 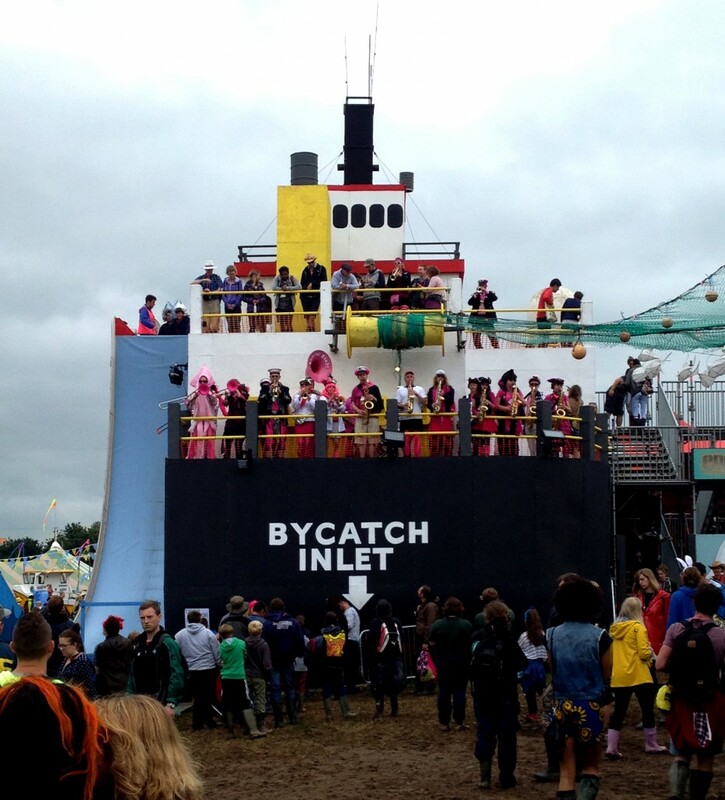 We built a giant fishing trawler and invited members of the public to dress up as fish and large sea mammals, get caught in the huge net and sucked up into the bowels of the industrial ship, where they then had to fling themselves off the side of a 7 meter high drop slide – to symbolise the thousands of creatures that get caught by accident each year as ‘by-catch’ and then thrown back out to sea, dead. 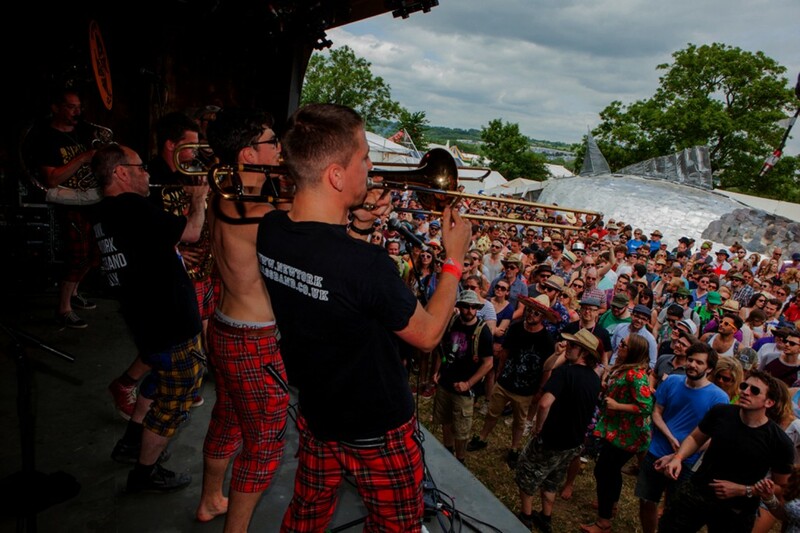 The Engine Room venue was much larger this year, with a fully licensed bar and top class bands and DJ’s playing till 3am. 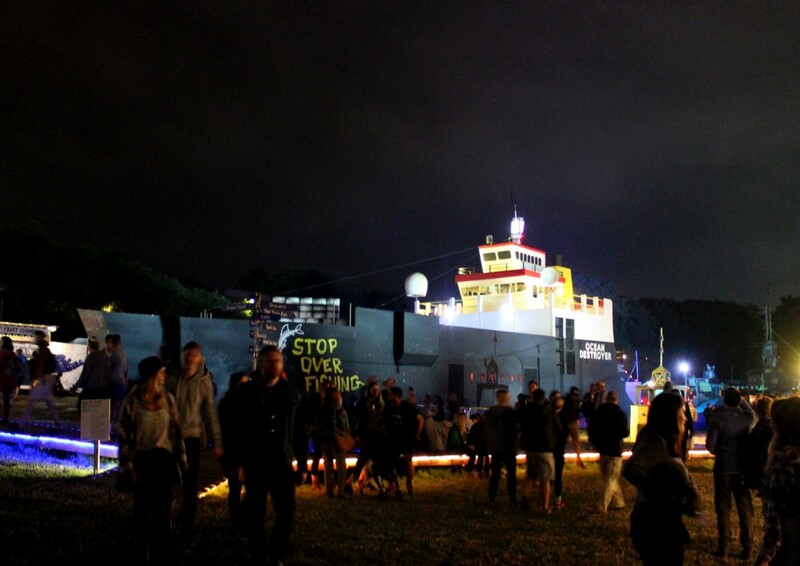 To make the most of this we created a stage in the ship, that played out onto the field during the day, and then into the bowels of the dirty fishing vessel in the wee hours. 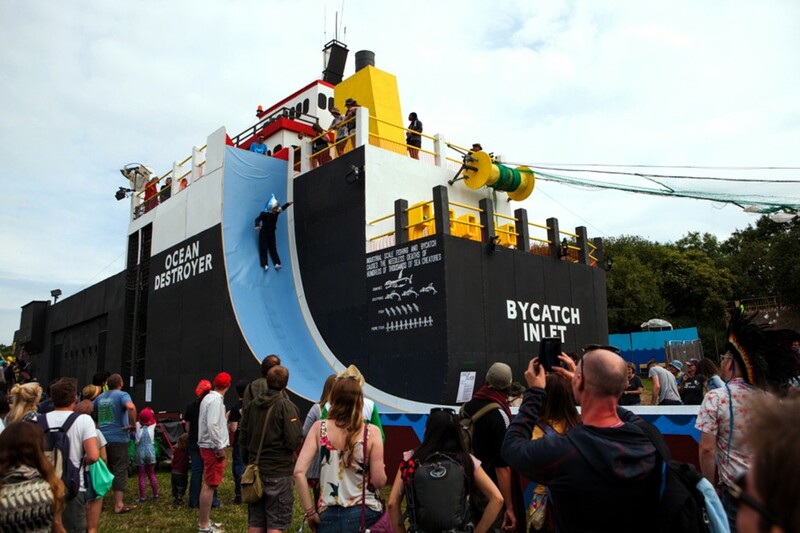 The ship was truly multifunctional – incorporating a climbing wall for activists-to-be to practice dropping banners on the ‘Ocean Destroyer’, while the stern comprised a two tiered viewing platform, with an immersive sound and light installation in the bowels, and an audio installation on the top deck sharing true stories from some of today’s British small-scale fishermen. 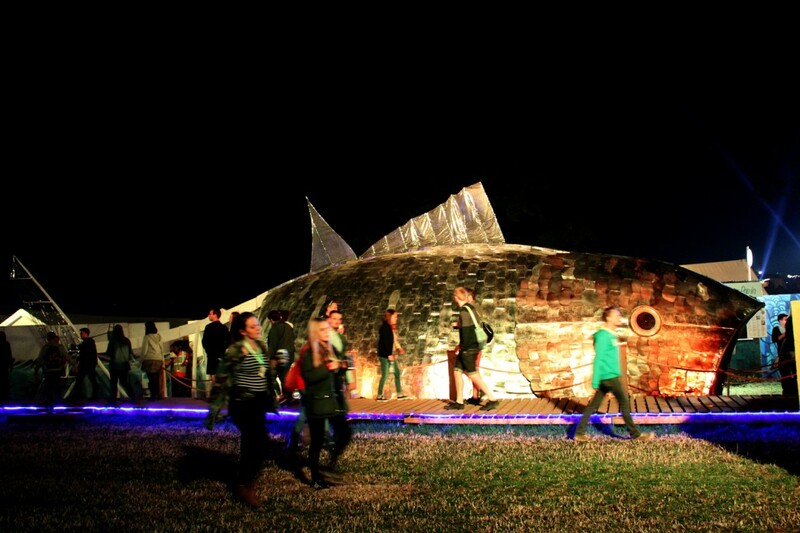 The field also hosted a huge beautiful sparkling Tuna fish, that people could walk through, designed and built by Kirsten Flemming and Ian Pildich. 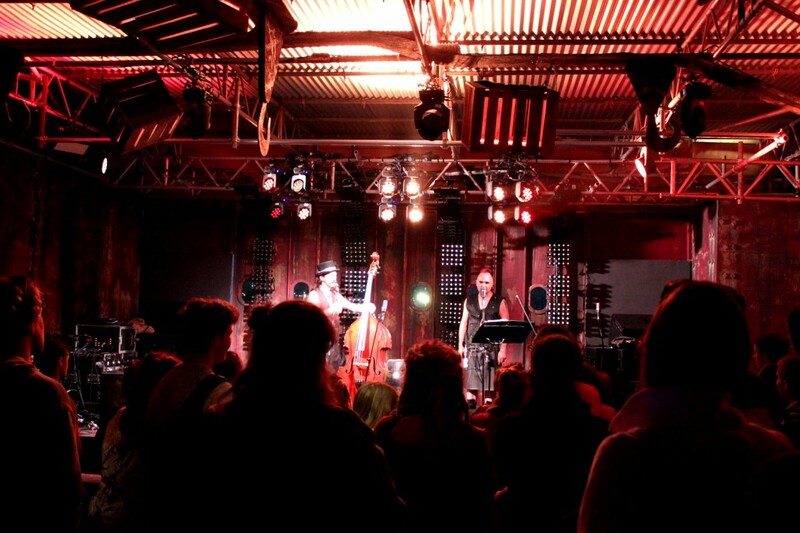 The frame was CNC cut out of SmartPly, a formaldehyde-free type of OSB. 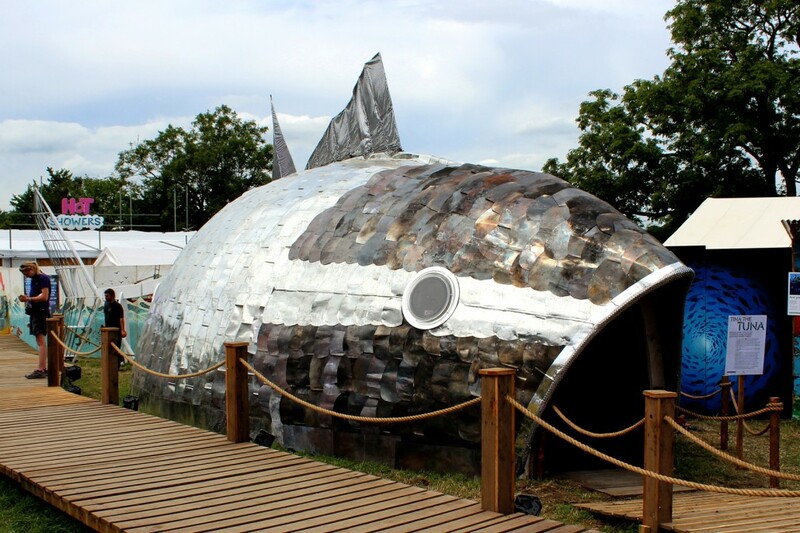 The fish scales were crafted out of hundreds of waste vegetable oil tins which were on their third use. Originally containing oil for cooking, they were reused to collect chip fat from chippies to convert into biofuel. 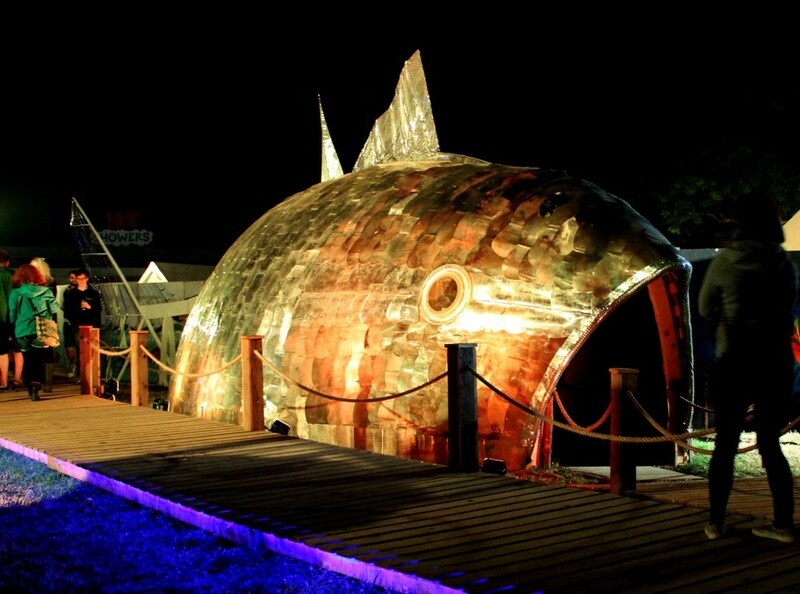 We then collected, cleaned and crafted them to form the scaly tuna. 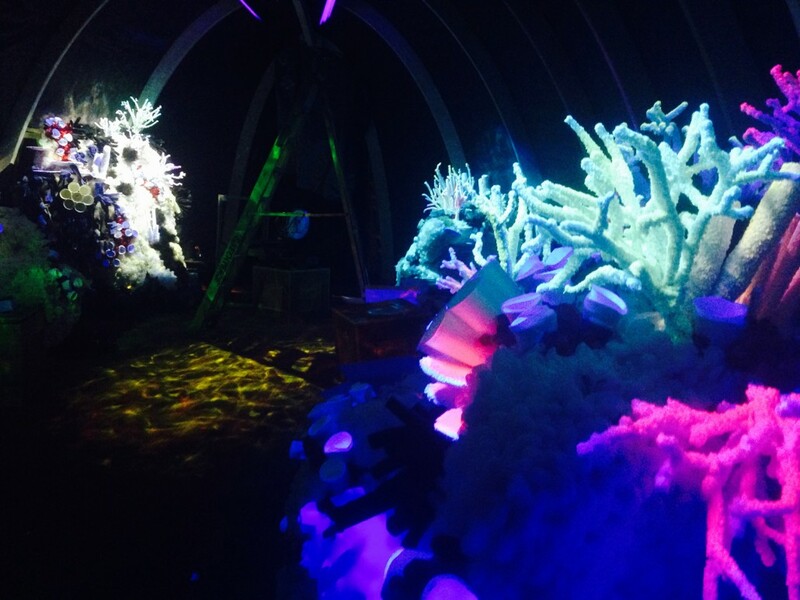 The fish housed the Coral Garden, a collaboration with Snow Business who made the coral, and Hellicar and Lewis who developed the interactive elements. 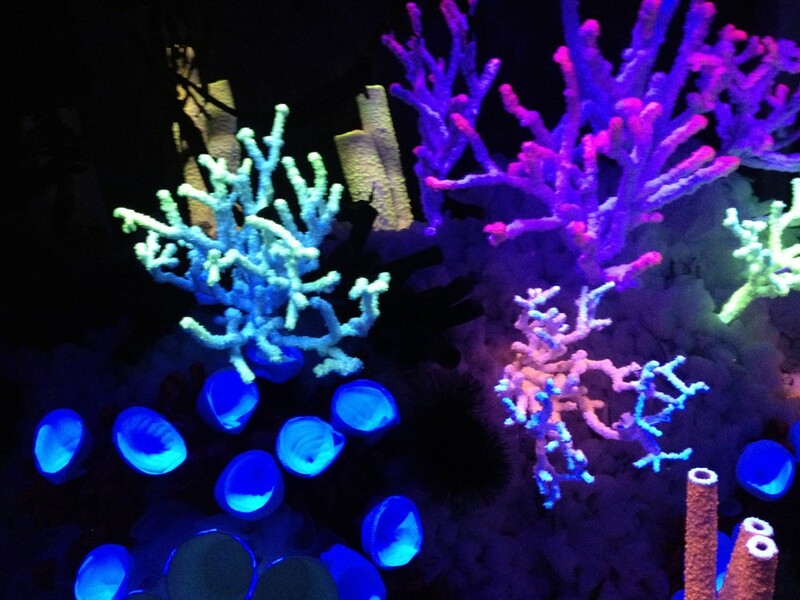 When you don a headset and take a seat in amongst the coral, the reef starts to glow and pulse in the UV lights, and a story starts in your ears about an eel being evicted to make way for coal ships. A record number of signatures were collected for the ‘Save the Reef’ petition, and we were blessed by a very special visitor: His Holiness the Dalai Lama came for lunch in the Greenpeace Cafe and walked through the tuna fish to experience the beauty of the coral. The campaign seems to have worked: Standard Charter, the last bank who was willing to fund the clearing of a channel through the Great Barrier Reef, has pulled out, meaning the reef has been saved, for now.